Each new school year I try and make new goals for myself to improve as an educator. This year I chose two focuses where I feel like I can always improve: Writing and Technology! 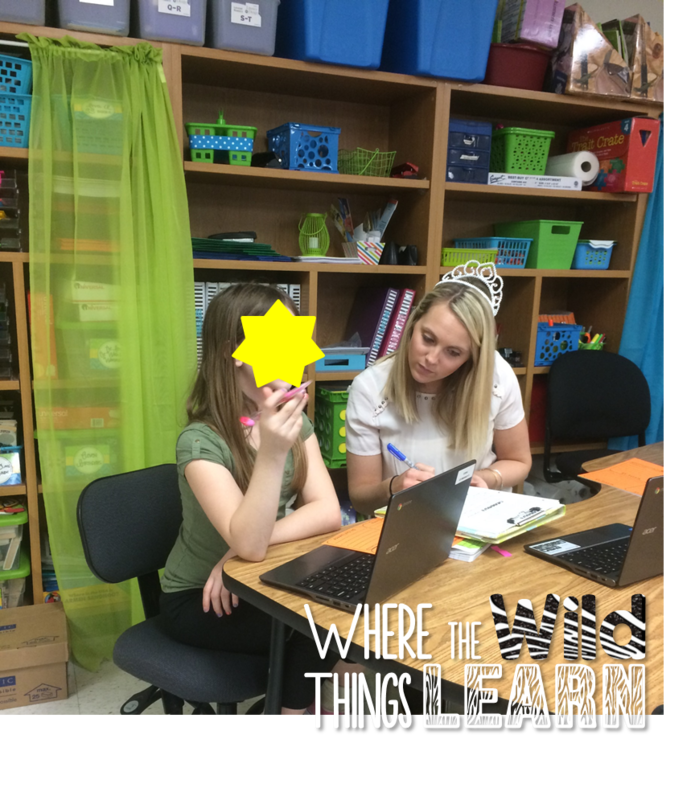 I will be starting a Tech Series here soon, but first I wanted to share a few things that I have been trying to do this year to improve my writing instruction. One of the biggest things that happens each year is my writers seem to lose interest or enthusiasm after the beginning of the year. 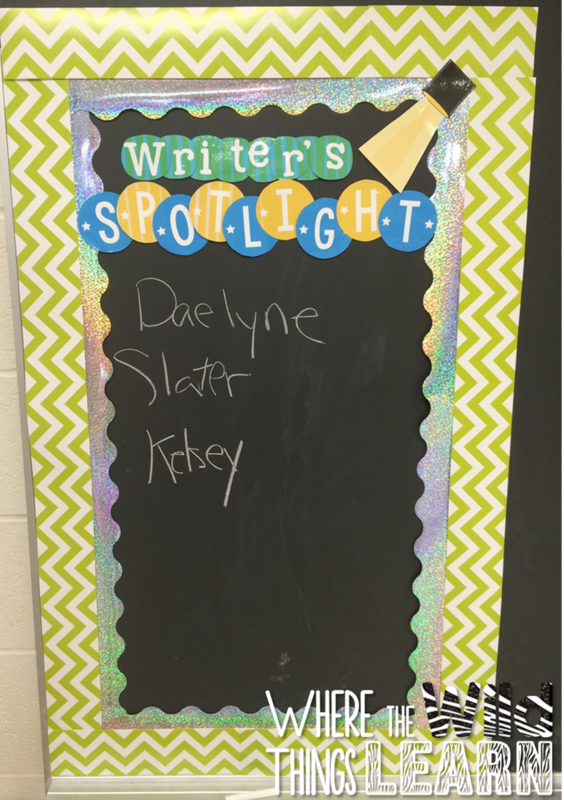 I decided to encourage writing by creating a "Writer's Spotlight." With my AM class, the last 5-8 minutes before lunch is reserved for this, and my PM class the last 5-8 minutes at the end of the day. 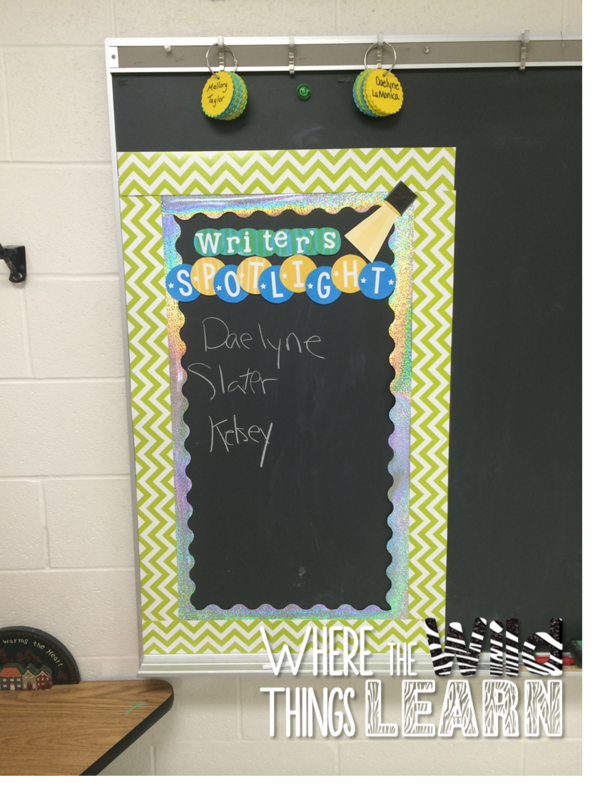 Students can sign-up to be put in the spotlight and share any writing that they have been working on. It can be an assignment, or just a free write, whatever they choose. I created this cute little sign-up board and they LOVE it! They get the microphone, we turn down the lights and put a "spotlight" on (a lamp next to them) and they share their writing. They are so proud and excited to share-- I LOVE it! I also made writing a part of my daily routine. Students have a separate writing journal. Work on Writing is a station at least 2 times a week, if not more. That gives them 20 minutes to write freely on any topic they choose. I provide monthly themed writing prompts that they can use if they don't know what to write! You can get those here. Next, I try and conference with each student at least once a week, if not more. 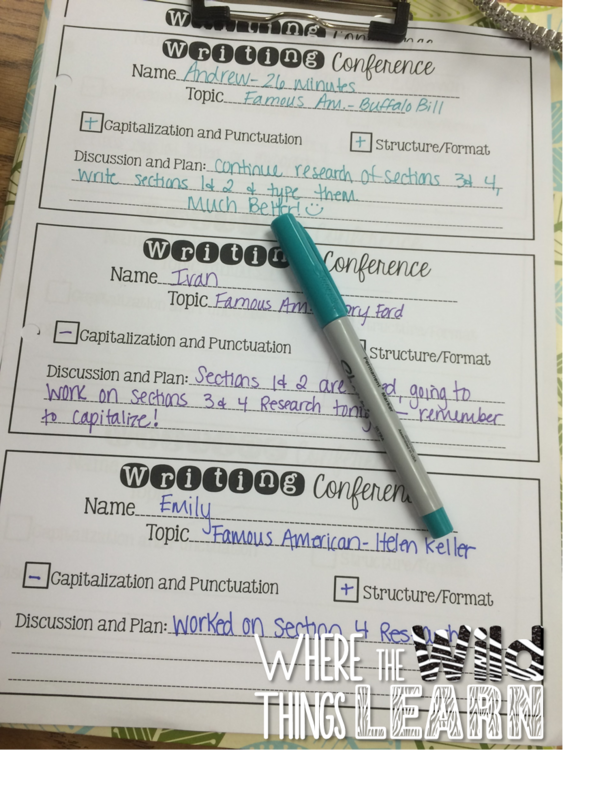 I created this quick little conferencing form so I can record notes and keep data on each student's writing. It is nice to refer back to together and see how they've progressed, too! ^^My Teacher tools for writing conferences^^ My Thirty One Teacher Caddy with highlighters, colored pens, post-its, paper clips, scissors, dry erase markers, pencils, and scissors. 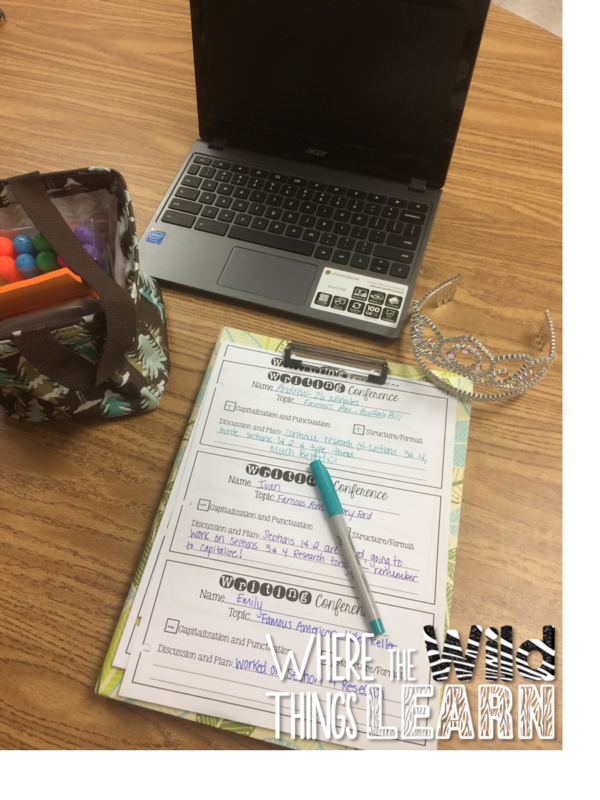 My crown so students do not interrupt during a conference, a Chrome Book where I can look up or share information, and my running notes page. Great ideas Amelia! I need to make more time for individual writing conferences, it's just so easy to lose that time during the day. 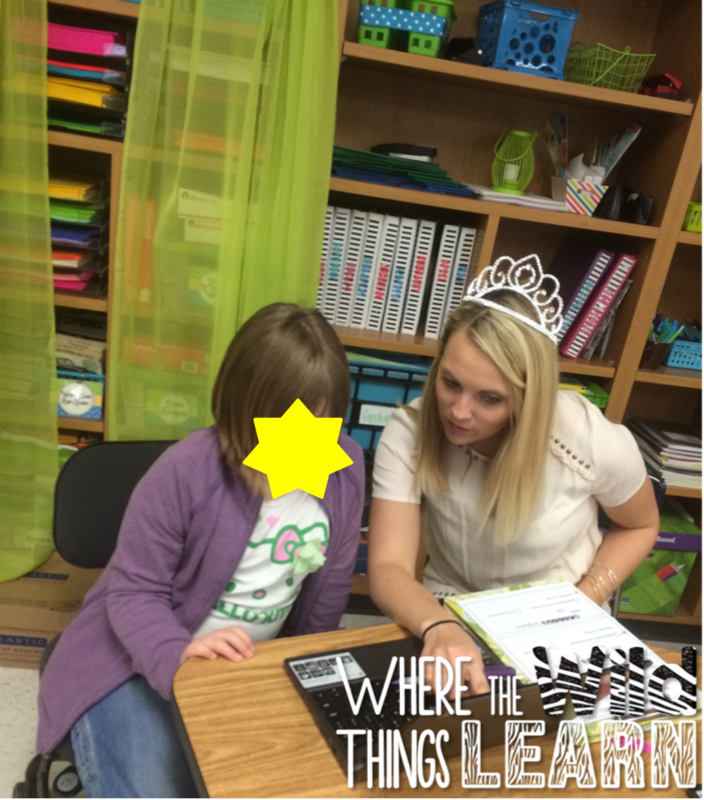 I love that you wear your crown during writing too, I have one as well (it's all about sparkle!). I usually only wear it during, but I think I should wear it ANY TIME I'm meeting with students...there'd be a lot less disruptions! LOL! Thanks for sharing your reflective thinking! I think it's really important to teach children how to write. And I'm not talking about grammar or punctuation. I'm talking about understanding the structure, picking the right words and so on. Maybe if all the children will have such lessons, they won't be needed reading any review of Evolution writers and buy papers online.